Leading Australian life sciences companies to major investment hubs around the world including Australia, Hong Kong, China, the US and Europe. Arranging access to opportunities for collaboration, partnerships and alternative funding. Providing investor support and education both domestically and internationally. The AusBiotech-led Global Investment Program aims to improve management and workforce skills. AusBiotech is working with consortium partners the ASX, DibbsBarker, WE Buchan and KPMG, all of which bring extensive insight and experience in the life sciences to enhance the capability of the sector to engage with international markets and access global supply chains. This venture has received funding through the MTPConnect Project Fund Program – a dollar-for-dollar matched program investing in big, bold ideas to improve the productivity, competitiveness and innovative capacity of Australia’s medical technology, biotechnology and pharmaceutical sector, supported by the Australian Government Industry Growth Centres Initiative. Major outcomes of this program include the development and publication of a “Guide to Life Sciences Investing”, the development and delivery of workshops for “Roadmap to preparing for a successful IPO” and “Pitching to Investors” and the upscaling and enhancement of AusBiotech’s current global investment event series. In 2017, the AusBiotech-led Asian Investment Series confirmed that investor interest in the Australian life science industry is strong and intensifying. Almost 400 delegates gathered to hear 21 Australian biotechnology and medical technology companies present their investment proposition as part of the Series, which was held in Singapore, Hong Kong and Shanghai during March. AusBiotech's former CEO, Glenn Cross, who led the three events, said: "This strong investor interest in the Australian life sciences stems from the nation's top ranking in the global life sciences and its diverse suite of investment opportunities in biotechnology and pharmaceuticals." Read the article, Asian Investor series confirms strong investor interest. Professional investors looking for promising biotech investment opportunities. There has been an increase in investment into life sciences companies and technologies in recent years. Yet investor hesitancy remains, as information regarding the sector is often highly complex, unconsolidated and difficult to access. This Guide will build an improved understanding of the unique life sciences sector to increase quantity and quality of investment in life sciences companies. The Roadmap (first edition, 2017) will prepare life sciences companies for initial public offerings (IPOs), providing independent expert information that is specific to the life sciences sector. While listing on Australian Securities Exchange (ASX) is a common pathway for life sciences companies, long-term strategy and risk must be considered prior to pursuing an IPO. The Roadmap aims to provide life sciences companies with independent, non-proprietary information about becoming an ASX–listed company. 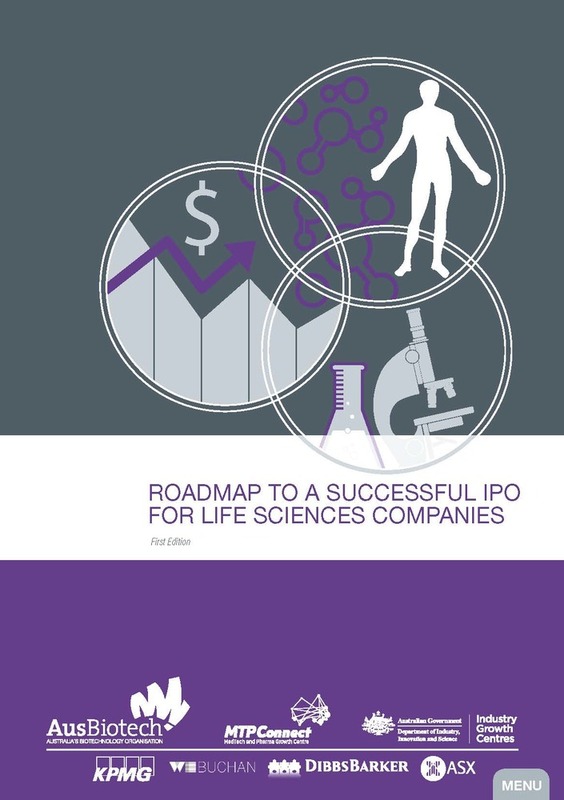 The Roadmap will be accompanied by complementary seminars in 2018 to assist life sciences companies in deciding whether an IPO pathway is a suitable option. It will raise awareness, educate and inform life sciences companies about the key considerations to becoming IPO-ready. To compete in a crowded space and attract funding and investment, CEOs must effectively communicate the potential economic value of their products, needs and commercialisation strategy. This workshop will provide training and resource materials to advance pitching skills and the tools to develop an effective investment strategy. For more information regarding AusBiotech Investment please contact Hayley Laing, National Event Operations Manager: hlaing@ausbiotech.org or 03 9828 1400. © 2016 Ausbiotech, All rights reserved.